2. The net clear opening dimensions shall be the result of normal operation of the opening. 3. 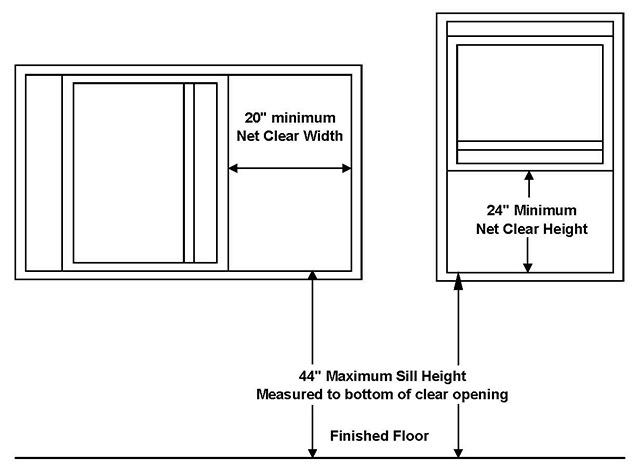 Casement window openings shall be measured when opened a minimum of 90 degrees. 4. Replacement windows must comply with the current window replacement policy. Check with Champion Windows for maximum window size. Select Window Series: 7000 Series Windows 7100 Series Windows Note: This calculator is only for Champion 7000/7100 series windows. Enter Callout Size: A three six five zero (3650) is a callout size that is three feet and six inches wide and five feet tall (42 inches wide by 60 inches tall). Please click Reset before entering new RO number. Daylight Width: Does not meet 20" minimum egress clearance. Meets 20" minimum egress clearance. Daylight Height: Does not meet 24" minimum egress clearance. Meets 24" minimum egress clearance. Daylight in Square Feet: Does not meet 5.7" square foot minimum egress clearance. Meets 5.7" square foot minimum egress clearance.